SUMMARY: Direct extension of a glioblastoma through the dura at the skull base is an uncommon occurrence. We report an unusual case of recurrent glioblastoma that spread transdurally through the foramen ovale and presented primarily as a masticator space mass. There was mandibular denervation and a relative paucity of intracranial disease. Despite the aggressive nature of glioblastoma multiforme (GBM), extracranial spread is not a common occurrence. With improving treatment options and survival times, reports of extracranial recurrence of GBM have increased. Most commonly these metastases are to the lungs, lymph nodes, liver, and bones.1 There have been many fewer reports of glioblastoma spreading primarily through the skull base. We report an exceptional case of GBM spreading extracranially through a natural skull base foramen and presenting primarily as a masticator space mass. A 53-year-old right-handed man without significant medical history initially presented in October of 2006 with headaches, right-sided hemiparesis, and episodes of odd episodic smells. He was found to have a left temporal lobe mass, which was resected via a left pterional craniotomy and was found to be a grade IV astrocytoma with infiltration of the dura and leptomeninges. He received chemoradiation and 11 cycles of temozolomide (Temodar) monotherapy. Approximately 15 months later, he experienced hearing loss and chronic drainage from his left ear. Review of systems was also positive for left jaw and tongue numbness. His physical examination revealed left temporal hollowing and slight left facial asymmetry. There was dense numbness over the central left V3 distribution. Other cranial nerves were intact. MR imaging performed in February 2008 demonstrated abnormal soft-tissue extending transcranially through the widened foramen ovale into the infratemporal fossa (Fig 1). Additionally, findings of subacute denervation involving the muscles of mastication were noted, including atrophy and hyperintensity on T2-weighted imaging. Intracranially, there were expected postoperative changes related to the prior pterional craniotomy, remote from the skull base foramina and without significant soft-tissue mass at the craniotomy site. A 53-year-old man with history of glioblastoma presented with chronic otomastoiditis and mandibular nerve denervation. A, Coronal T2-weighted MR image demonstrates a transcranial mass extending through the left foramen ovale, with the largest component in the masticator space (white arrowheads). Subacute denervation of the left medial pterygoid and masseter muscles is evidenced by their increased signal intensity and decreased volume (white arrows). Chronic postoperative and treatment-related changes are noted in the left middle cranial fossa and left temporal lobe (black arrow). 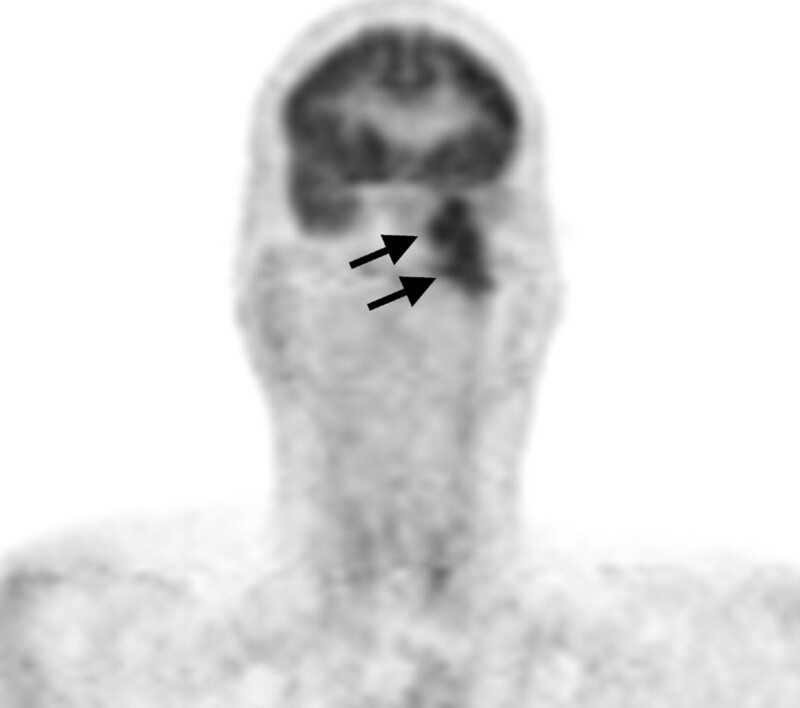 B, Axial contrast-enhanced fat-suppressed T1-weighted MR image demonstrates the extracranial portion of the mass interposed between the left medial and lateral pterygoid muscles (white arrowheads). The left temporalis and masseter muscles demonstrate asymmetrically decreased volume (white arrows). Note the mass effect on the left eustachian tube orifice and abnormal signal within the left mastoid air cells, likely on an obstructive basis (black arrow). A positron-emission tomography (PET)/CT performed in March 2008 demonstrated the mass to be hypermetabolic with a maximum standard uptake value of 10.9–12.0 g/mL (Fig 2). PET images in the coronal plane clearly show transcranial tumor extending from the floor of the left middle cranial fossa into the soft tissues of the left deep face (black arrows). In April of 2008, the patient underwent transnasal and transmaxillary infratemporal fossa biopsies utilizing CT navigation. Light microscopy showed atypical cells with hyperchromatic nuclei and mitotic activity as well as areas of palisading necrosis. Cells stained strongly positive for glial fibrillary acidic protein, vimentin, and S100 and were negative for epithelial membrane antigen, synaptophysin, cytokeratins (AE1/AE3), and neurofilament. A diagnosis of recurrent GBM was made. We were able to find 12 reported cases of glioblastoma spreading spontaneously through the skull base. They are summarized in the Table. Our case is unique in that there was minimal intracranial/intradural disease and isolated extension through the native foramen ovale. This resulted in a large masticator space mass and denervation in the distribution of the mandibular nerve. Due to the rarity of such a presentation, we were initially forced to expand our differential diagnosis to include pathology arising primarily within the masticator space. In summary, the extracranial spread of a glioblastoma, particularly through an intact dura, is a rare occurrence. We reviewed the different mechanisms by which glioblastomas are thought to spread and presented a unique case of recurrent tumor that extended through foramen ovale, resulting in a large volume of extradural tumor and secondary denervation. Accepted after revision August 30, 2008.